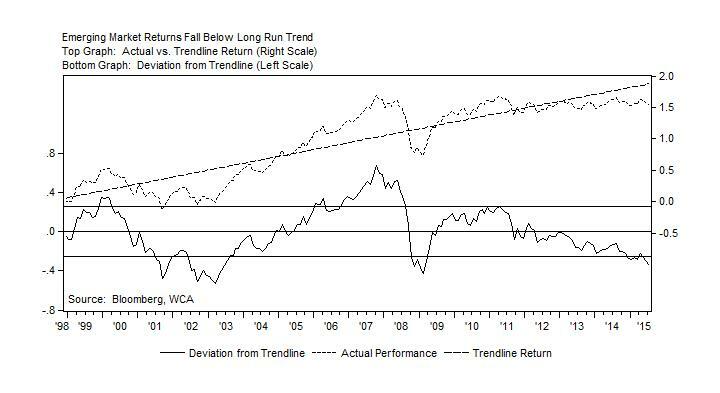 We see higher long-run returns from emerging markets after a five year period of sideways performance and as returns in recent years push the Morgan Stanley Capital International (MSCI) EM Index well below the long-run trend (chart below). We are currently expecting long-run EM equity returns to be about 1% higher than our current long-run domestic equity return, now that the emerging markets have suffered through five years of sideways market action and underperformance versus developed equity markets. The multi-year slog for emerging market investors means that major EM indices remain near the levels seen during the 2008-2009 recession, despite growth across much of the emerging market economies since then (average 5.7% per year). The sideways performance for EM compares to much stronger U.S. equity returns, and the category has become far less popular among managers (more on this later). Based largely on valuation, we reintroduced emerging markets with a neutral weighting to asset allocation portfolios roughly a year ago, and our basic view remains the same today. We saw the long-running underperformance as discounting much of the bearishness surrounding EM prospects, and at 13x earnings, we felt the category offered a better alternative than small-cap domestic stocks at 18x earnings. Our tactical decision was to take emerging markets from a zero weight to a neutral weight, based largely on what we saw to be better relative valuations. To date, emerging markets have struggled as global growth and China continued to slow, commodities remained under pressure, and the Fed looks to embark on its first-attempted rate increase in over a decade later this year. The bull case for emerging markets is a contrarian one. After five years of underperformance compared to developed world equity markets, the category has gone from overlooked and over-owned (2006-2007) to overlooked and under-owned today. This can be seen in valuations where relative price-to-book multiples are much more attractive today for emerging markets. Today the ratio of the MSCI EM price-to-book to MSCI World price-to-book stands near 0.7x – down significantly from the peak ratio of just above 1.1x back in 2010. Moreover, at 0.7x book value, the category appears inexpensive versus the historic multiple, too. The last time this multiple was at these levels was back in 2004. Pessimism is also seen in EM allocations by portfolio managers, which reached their lowest level in more than six years last March before showing some improvement in April, according to the Institute of International Finance. The risks of investing in emerging markets are well known and have evolved over the years. These economies are subject to more volatile swings than developed markets, although their growth rates have typically been higher. The emerging markets are heavily tied to commodity demand and prices, they tend to be less liquid, currency swings can impact returns, and contagion is common. This has all been part of the history of emerging markets as they evolved over the years, and these risks have been apparent recently as commodity prices continue to weaken. Still, emerging markets have grown faster than the United States over the past several decades, and returns have been similarly higher for equity investors, but not without commensurate risks. Based on World Bank data, advanced economies produced real trend line growth near 4.8% from 1980-2015, but emerging markets nearly doubled that growth rate with a 7.7% annualized growth rate in (Gross Domestic Product) GDP. Looking out from here, both growth rates are expected to slow as the World Bank sees 4.3% growth from advanced economies and 7.5% growth from emerging economies out through 2020. Even if these rates end up being overly aggressive, our review of long-run economic fundamentals (demographics, capital investment, and productivity) suggest that growth should be higher for emerging markets over time. Although the entry point today appears better, there are a near-term risks to the outlook. For this reason, we are maintaining a neutral allocation to EM in tactical portfolios and not yet moving to overweight. On a relative basis, for example, the performance of the group is still lagging, and forecasts for global growth are still weak. In addition, global growth rates are still being cut. The World Bank, for example, recently cut their outlook for global growth by 0.2% to a below-trend 2.8%. China’s slowdown, in particular, is weighing on commodity prices and dampening near-term emerging market growth prospects. The other risk involves that of a faster-than-expected rise in U.S. short-term rates once the Fed starts to tighten. If low-cost dollar funding is removed faster than anticipated, pressures on portfolio and capital flows could rise, and emerging markets, along with their currencies, could potentially become volatile. Tail risks under this scenario could increase, and EM volatility could increase sharply. While we may still be in for some choppiness in the months ahead, we think the combination of relatively attractive valuations resulting from several years’ underperformance is discounting a large portion of these concerns already. We are also aware that monthly volatility and correlations with developed equity markets are both tracking lower since 2012, making the category more attractive from a risk and diversification perspective too. Consequently, we see emerging markets providing useful growth and diversification characteristics to portfolios, but a longer-term viewpoint is necessary. We will continue to evaluate expected returns and portfolio positioning in the weeks ahead, as emerging markets look to break out of a five-year period of lackluster returns and consolidation. Earnings are expected to decline by 3.7% for the second quarter versus the same period a year ago, as decent growth in the United States is being offset by China and slow growth in Europe. Lower commodity prices will again weigh on commodity-driven companies. Excluding Apple, technology is expected to post a decline of 6% for the second quarter, according to FactSet, and energy and materials companies will continue to drag on results. Revenue explains most of the slippage, as the S&P 500’s top-line is expected to slip 4%. Forecast S&P 500 net profit margins should rise to 10.2% in the second quarter to 10.6% by the fourth quarter according to analysts, but this isn’t what we are seeing in the data. Instead, margins are currently slipping at the same time that wages appear to be firming. On a trailing 12-month basis, net margins are slipping, and they have declined to 9.7% from over 10% a couple months ago. The historic 10-year net margin is 8.7%. To avoid further profit misses later this year, this trend needs to reverse. LONG-RUN STRATEGIC POSTURE: Strategic allocations are set to reflect our long-run forecasts for key asset classes. We expect the domestic economy to grow near 2.3% over time, driven by modest growth in the labor force, positive contributions from capital investment, and increasing innovation and technology-driven productivity gains. Cash returns should rise gradually toward a long-run target near 3.5-4% and should average roughly 2% over the next five years as the Fed raises rates in acknowledgement of tightening labor markets and a further closing of the economy’s output gap (a measure of slack). Inflation expectations should remain anchored near 2%.